PLC « Global Market Insights, Inc.
Smart electric meter market over the recent years has garnered considerable traction in the sustainable ecosphere. Endowed with improved connectivity & advanced features, smart meter technology has emerged as a viable alternative to conventional meters. Indeed, this extraordinary evolution from the conventional models to their smart counterparts has ensured a lucrative growth for the overall electricity sector, which is rather a focal vertical for the energy saving rollouts. Evidence in support of the aforesaid is smart electric meter market valuation of over USD 7 billion in 2017, led chiefly by favorable governmental initiatives and sustainable energy mix protocols. 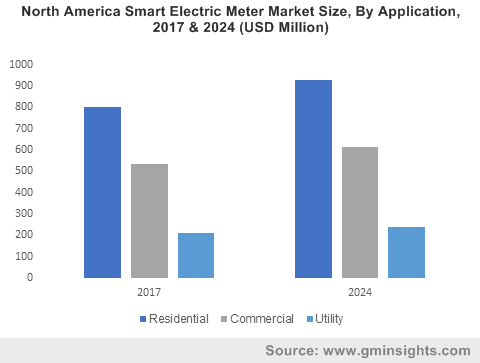 A report by Global Market Insights, Inc., claims that with further awareness regarding climate change & GHG emissions, the worldwide smart electric meter market is likely to surpass annual installations of 190 million units by 2024. Elaborating further, the recent years have remarkably witnessed smart meters penetrating the utilities domain mainly on the cusp of rapid growth in industrial IoT. The technology adoption has ensured a more accurate real-time power diagnostics and billing. These meters are enabling consumers to optimally utilize the energy, further reducing the overall carbon emissions. 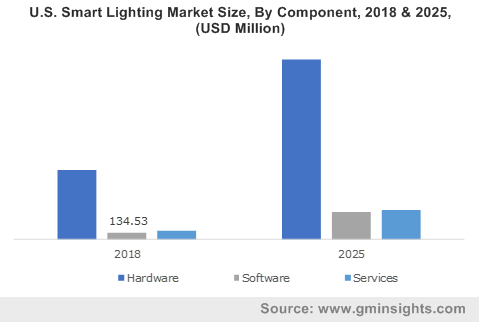 In fact, analysts foresee a mass acceptance of this environment-friendly and cost-effective technology in the electric domain, which will have a pronounced impact on the global smart electric meter market trends. Particularizing on the geographical landscape, the year 2017 witnessed China accounting for more than 70% of smart electric meter market share across the Asia Pacific belt. Reports claim that the country’s 12th and 13th five-year plan that includes development of smart cities has generated extensive demand for effective water and electricity monitoring, which in turn have positioned China into a favorable business ground for smart electric meter market players. Add to it, the Asian Development Bank’s support in smart meter roll-outs in line with the adoption of smart-grid & sustainable technologies have phenomenally impacted the regional trends. India has also recently entered the global smart-meter deployment race and has emerged as the next lucrative growth ground for potential stakeholders. The country has recently grabbed the headlines with its move to replace 40 lakh conventional electric meters with the smart ones. The move is headed by the UPPCL (Uttar Pradesh Power Corporation) in association with EESL (Energy Efficiency Services) that aims to address the state’s energy efficiency woes and ensure customer convenience. Another important move fortifying the regional smart electric meter market share is of the Bihar state energy department, that aims to install 200,000 prepaid smart electricity meters in cities including Ara, Patna, Bhagalpur, and Aurangabad. Experts deem the Rs 800 crore (approximately USD 117 million) project to offer fair investment opportunities, in turn categorizing India into one of the profitable avenues for expansion of the smart electric meter industry. Smart electric meter deployment trends are also catching up in other prominent regions including Germany, UK, the United States, and Canada. As per estimates, U.S. smart electric meter industry share is set to cross the billion-dollar mark by 2024. As per a EIA report in 2015, smart meter deployment across the residential sector in the U.S. stood at 40%. Also, the regional electric utilities registered an AMI (Advanced metering infrastructure) installations of over 70 million till 2016. UK on other hand is targets to deploy 50 million smart meters in 30 million households by 2020, with an aim to lower the domestic energy consumption by 5 to 15%. Analyzing these geographical trends, it comes as no surprise the smart electric meter industry will bring about a revolution of sorts in the utility sector. Analysts deem that this business sphere is all set to witness steep growth with more than 190 nations taking part in the UN Climate Change Conference to reduce emissions. Toshiba’s Landis+Gyr, Silver Spring Networks, Siemens, Itron, and Schneider are some of the prominent smart electric meter providers working in tandem with system integrators like IBM and Accenture to further take the global smart electric meter market size to new heights of expansion. This entry was posted in Sustainable & Smart Technologies and tagged AMI, AMR, Cellular, Commercial, Global Smart Electric Meter Market, PLC, Residential, RF, Single Phase, Smart Electric Meter Market, Smart Electric Meter Market Analysis, Smart Electric Meter Market Leaders, Smart Electric Meter Market Share, Smart Electric Meter Market Size, Three Phase, Utility.